Groundnuts first evolved through a chance cross between two wild species between six to eight thousand years ago. Today, there are 79 known wild species and perhaps a few more undiscovered species. Archeologists have found evidence of groundnut dating back more than 7,000 years. At the time of the Spanish and Portuguese conquest, the crop was widely grown in the West Indies and in South America. By the latter part of the 16th century it had spread to West Africa through the slave trade. At the time of the Spanish and Portuguese conquest, groundnut was widely grown in South America. By the latter part of the 16th century it had spread to West Africa and soon after to South Asia. It is currently grown on about 22 million hectares worldwide, an area roughly equal in size to the United Kingdom. 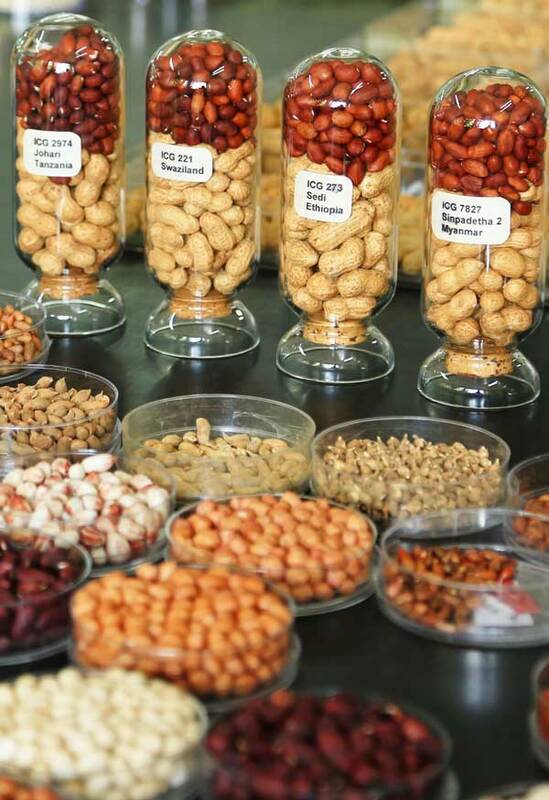 Rich in protein and edible oil, groundnut (Arachis hypogaea) is central to the financial and nutritional well-being of hundreds of millions of farmers and consumers across the semi-arid tropics. Nutrition experts point out that groundnut provides over 30 essential nutrients and is an excellent source of niacin, fiber and vitamin E. Rich in anti-oxidants, the crop is naturally free of transfats and contains about 25% protein, a higher proportion than any other true nut. Increasingly, however, its greatest value is as an income generator. At many locations in West Africa, groundnuts are largely grown by women for the benefit of their families and are used to pay school fees and purchase household essentials. Many of the best improved varieties, some of which are twice as productive as the lines they replaced, were selected by women farmers in Mali and Niger working with national and international plant breeders. For subsistence farmers who lack the cash to purchase commercial fertilizers, groundnut’s nitrogen-fixing capabilities serves as an important soil management tool that contributes both to greater productivity and to the overall resilience of their farming operations. Groundnut is currently grown on about 21.8 million hectares worldwide, an area similar in size to the United Kingdom. Global production (2011) totaled 38.6 million tons, 95 percent of which occurred in developing countries. Major producers include China, India, Nigeria, USA, and Myanmar. Common names include earthnuts, goober peas, monkey nuts, peanut, pygmy nuts and pig nuts.